I’ve been attempting to go to the Hazelwood Food Market for a few weeks but somehow something always gets in the way. Sleep is really important guys :-P. But I finally managed to drag myself out of bed and head to the market. As it turns out, getting out of bed was the easy part. Finding the market was a different story. It turns out that the Hazelwood Market is not in Hazelwood but in Greenlyn. So don’t head towards Hazelwood. You’ll probably be as confused as I was. The Market is at the end of the parking area of Greenlyn Village Centre. It’s a medium sized market but it’s packed with food, drinks and flowers. It brought a tear to my eye. I was so excited to see so much food in one area that I had no idea what to do with myself or where to start. Walking through the market, I wanted to try everything but realising that I couldn’t eat everything, I focussed on a few interesting stalls. 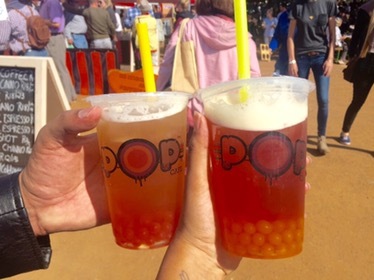 The first stall was The Pop Café, a Bubble Tea stall. Since we weren’t sure what good combinations to use, the gentlemen at the store kindly recommended 2 drinks. The first was a green tea with lemon bubble tea and melon boba. It was delicious! The lemon added depth to the green tea and the melon boba was refreshing. The second was a rooibos tea with passion fruit boba. This was refreshing as well but not as yummy as the first tea. The second stall was the Churros. Every since being banned from eating Churros from a street vendor in Rio de Janeiro, I’ve been dying to get my hands on one. The stall has 2 variations: the normal churros (in mini or normal size) and a red velvet churro. Seeing that I’d never tried a churro, I thought it best to start with the original. There were 2 filling options: chocolate and dulce de leche. I decided to go with chocolate. The churro was divine! It was crunchy and sweet. Definitely well worth the wait, although I feel it may have been even more tasty on the streets of Rio. After walking around for a bit, we found Katayef Persian Pasteries and bought 6 traditional Jordian sweet – Qattayef- with Nutella fillings. The pastry is deep-fried and soaked in sugar syrup before serving. It sounds sickenly sweet but it’s not. Somehow, the pastry balances out the sweetness and you can eat many in a row. Trust me, I’ve tried it and I don’t have sweet tooth, thanks to Banting. The next stall was the reason I got out of bed – Bun Box – a stall that sells steamed buns and dim sum. Ever since Cape Town, I’ve been struggling to find mind-blowing bao (steamed buns). But I think I’ve found my fix. Their steamed buns were light and fluffy. I had the pork boa and the pork was tender. It was delectable. I think I’m going to become a regular of the market, just to get my hands on their steamed buns. The last stall was the Fudge and Turkish Delight stall. Here, plain and rose Turkish Delight was spread over a huge pan. The Turkish Delight is made from corn syrup and after making peace with the fact that I’ll never find pistachio Turkish Delight in South Africa, I bought way to much Rose Turkish Delight. The Turkish Delight was sweet but yummy. I keep sneaking into the pantry at home to stuff 3 into my mouth. I’m pleased that I dragged myself out of bed and went to the market. The market has almost everything a foodie would want, at decent prices. I can’t wait for next week Saturday :-D.